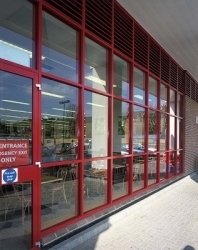 CDW Systems manufactures a complete range of aluminium facades including ground floor treatments, window wall and curtain walling, to suit all commercial project requirements. Our aluminium entrance facades can incorporate top hung, side hung, fixed lights, horiztontal and vertical sliding, tilt and turn and pivot window combinations. Windows are manufactured using a traditional resin thermal break or using a polyamide thermal barrier to ensure compliance with Part L of the Building Regulations using only hard coat low-e glass and standard spacers to IGUs.